BACKGROUND: A proficiency-based laparoscopic skills training curriculum for the Fundamentals of Laparoscopic Surgery (FLS) program has been used to advance certain skill sets fundamental to laparoscopy by many surgical training programs. The aims of this study are: 1. to find the component(s) of laparoscopic training within FLS that have the greatest effect on skill advancement and 2. to determine whether this curriculum is beneficial for residents at all levels of training. METHODS: In the 2009-10 academic year, all 27 surgical residents at our institution were baseline tested on each of the five FLS tasks. The residents then completed a previously validated proficiency-based laparoscopic skills training curriculum in which each of the five tasks was performed until a predetermined level of proficiency was achieved. All were then post-tested at the conclusion of the curriculum, and the differences between the two scores were calculated. The data were then compared (e.g. number of attempts, total time spent). RESULTS: All but one resident improved their overall score from pre- to post-curriculum testing (p<.001). There was a correlation between the number of attempts with a resultant fall in the time to task completion during the task of peg transfer. However, a threshold effect was observed after which additional attempts did not result in further decreases in time to task completion (Graph 1). For the remaining four tasks (pattern cutting, ligating loop placement, extra- and intra-corporeal knot tying), no correlation between completion of task and number of attempts, or total time spent was found for the entire group. For the overall group of residents, the difference between baseline and post-testing FLS scores was not influenced by the number of attempts, total time spent, or total number of days spent. However, the change in scores between the laparoscopically naive residents and all others was significant (p = 0.01). CONCLUSIONS: Task repetition for the initial peg transfer module showed a clear improvement in completion times which was not dependent on PGY status. 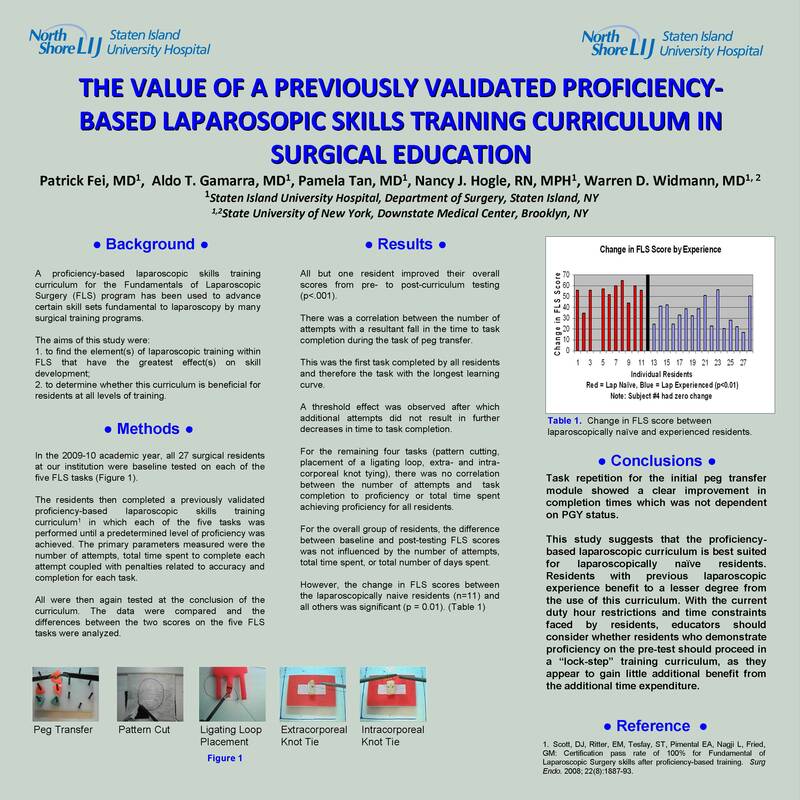 This study suggests that the proficiency-based laparoscopic curriculum is best suited for laparoscopically naïve residents. Residents with previous laparoscopic experience benefit to a lesser degree from the use of this curriculum. With the current duty hour restrictions and time constraints faced by residents, educators should consider whether residents who demonstrate proficiency on the pre-test must proceed in a “lock-step” training curriculum, as they will gain little additional benefit from this time-consuming activity.